And so it was with Australian Speedway great George Tatnell. Fans loved him, fans booed him but nobody was without an opinion. “GT” was a polarising individual. Cheeky, flamboyant, passionate, hard charging, out-spoken and never shy the former National Speedcar and Sprintcar champion and standout never left you guessing. This Saturday night the two classes he was most passionate about – Speedcars and Sprintcars – will go to their respective wars in the annual “GT Challenge” and drivers are coming from everywhere to compete. The Ultimate Sprintcar Championship and the Speedcar Super Series will converge on Sydney’s Valvoline Raceway – a fitting venue where George claimed many successes and his son Brooke went on to become a superstar like his father. Currently there are 29 cars entered for the second round of the Diamond Air-Conditioning Speedcar Super Series and drivers represent NSW, QLD, Victoria and New Zealand. 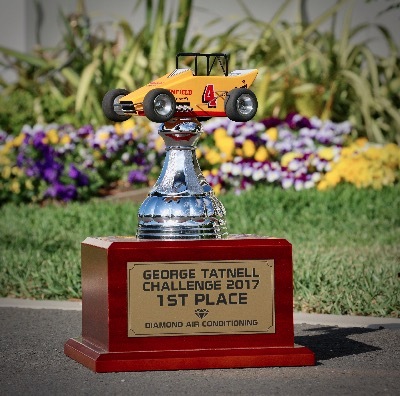 Series organiser Ken Jenkins has arranged, yet again this year, some unique trophies that feature three models of George Tatnell’s classic Speedcars thanks to Diamond Air-conditioning, Hoosier Tire Australia/Max Dumesny Motorsport and American Tire & Racing Services. The event marks the first return to VR this season for multiple Australian Speedcar Champion Adam Clarke and also sees livewire Victorian second generation throttle stomper Travis “Squizzy” Mills amongst others. The Ultimate Sprintcar Championship will again boast a field in excess of 50 cars with teams entered from the Northern Territory, Queensland, West Australia, the ACT and New South Wales. Defending Ultimate Sprintcar Champion Robbie Farr returns back across the Hay Plains where he ran third in the USC SA Championship last weekend at Murray Machining & Sheds Speedway Murray Bridge. Farr won the last main event held at Valvoline Raceway a fortnight ago but third generation racer Matt Dumesny may be more determined than anyone to avenge his disappointment of leading almost the entirety then finishing second in the same event. Feature race winners so far this season include Sam Walsh, Robbie Farr, James Thompson and Grant Anderson – all of which would love to repeat their early season victories. Kellyville’s James Thompson leads the Ultimate Sprintcar Championship points currently from Matt Dumesny who, despite not winning a main event as yet, is very much in contention in second place along with fellow young gun Daniel Sayre in third. Fender Benders are also on the program this Saturday night, December 9. Valvoline Raceway is located at 21 Wentworth Street Clyde. Check out www.valvolineraceway.com.au or like Valvoline Raceway on Facebook, Instagram and Twitter.